With Gratitude. It is a great honor for us to publicly recognize our remarkable donors and the extraordinary blessings they bestow upon the world through their support of The World Prayers Project. 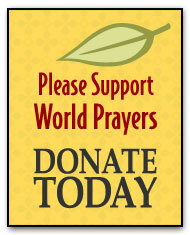 Their selfless giving helps to keep the World Prayers website online and available for free to everyone who visits. If you would like to learn more about becoming a supporting donor, please visit our donations page. A note to our donors: If we have forgotten to list your name or you wish to opt-out from having your name published on our donor page, please contact us.